Meet GPA-WI adopter Denise Moran from Chetek! In April 2018, Denise adopted her very first greyhound: three-year-old cow dog Persue, now known as “Percy.” Denise has shown her commitment to greyhound adoption by adopting a GPA-WI Blue Fund dog as well as showing great support for the organization! Percy’s road to adoption was not a smooth one, and Percy underwent three surgeries for severe swelling in his leg. His bumpy road to health began when he exhibited swelling in his leg after he arrived to Wisconsin for adoption. GPA-WI vets initially suspected that Percy had a flesh-eating disease known as “Alabama Rot,” which has become less common in recent decades in the U.S. but has recently gained momentum in Great Britain. Unfortunately, statistics on Alabama Rot indicate that up to 80 percent of the canines that become infected will eventually die from the disease. Fortunately, after normal bloodwork, normal kidney values, draining of the abscess and a round of antibiotics, Percy was back on the road to health a few weeks later. While Alabama Rot was a concern at the beginning, Percy did not have the disease. The funding for Percy’s veterinary care as he awaited adoption came from GPA-WI’s Blue Fund, a separate fund for greyhounds that need exceptional veterinary care. Blue Fund was established in 1997 to memorialize a greyhound named Blue who died unexpectedly at the age of seven. Since its inception, the Blue Fund has allowed GPA-WI to take in injured or ill dogs, pay for their veterinary care and place them in loving adoptive homes. While this separate fund is not tapped into on a frequent basis, GPA-WI always appreciates donations to the program as well as the generous adopters who adopt dogs that benefited from the program — like Denise. While Percy underwent his various veterinary procedures, he stayed at either the GPA-WI kennel in Burlington or with his foster parents, Gary and Cheryl Suckow in the town of Colgate. The Suckows drove many miles and made many trips to ensure that Percy was returning to health before he went home to Denise. Due to his health concerns and veterinary care, the Suckows ended up fostering Percy for close to one month, opposed to the usual two-week foster stays that most GPA-WI dogs experience. When Percy was ready to go to his forever home, the Suckows made the two-hour drive to Central Wisconsin to meet Denise halfway. In addition to Percy’s adoption, Denise’s superstar vigor kept on going with her generous donations to GPA-WI. Denise has provided GPA-WI with donations on three separate occasions: before, during and after her adoption of Percy. Most notably, she made a donation even before adopting Percy because she doesn’t like odd numbers. In March 2018, after GPA-WI hosted its Pins for Paws annual bowling fundraiser and announced the event’s grand total on Facebook, Denise saw something not quite right with the $3,119 figure and made a donation to round up the final dollar amount. 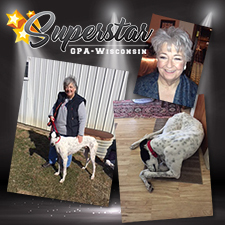 And thank you, Denise, for your kind display of philanthropy toward the mission of Greyhound Pets of America-Wisconsin … this is what makes a GPA-WI Superstar!